High pressure washing goes beyond sweeping to remove the deep down dirt and contaminants that shorten the life of your pavement. Kleen pavement will tailor a cleaning program to meet your needs and enhance the look and value of your property. 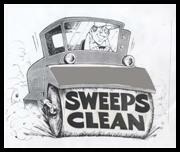 Sweeping removes the heavy debris and sand from the paved surface. Kleen Pavement has a wide variety of sweeping machines from small to large regenerative air and mechanical broom machines to get the job done on time, and on budget! High pressure washing loosens the carbon black build up and contaminants found on your paved surface preparing it for flushing. This is accomplished by the KleenMachine , a custom built truck mounted machine that high pressure washes an amazing 8 foot wide path with pressures up to 4000 PSI at 20 gallons per minute. Corners and hard to reach areas are done with 24”-30” diameter hand surface spinners with equally high pressure. Flushing moves all the loosened material to the approved drain areas. This is done with our 1200 gallon flusher trailers equipped with dual high volume low pressure pumps, hoses and wands. 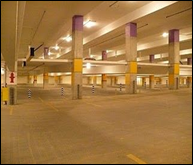 Kleen Pavement is on deck to tackle your smallest drive–thru, or your largest parking structure.